Henley’s customised solutions combine a passion to understand and develop organisations, a record of successful partnerships and outstanding expertise in executive development to transform organisational performance. Whether your leaders are executing strategy or strengthening operational capability, our customised solutions can help unleash the full potential of the individual, team and wider organisation. Together we co-create development solutions drawing on our unrivalled global experience in customised leadership, management and organisation development. With seasoned practitioners, expert faculty and high-profile contributors from private, public and third sectors, our reach extends across the world, including Europe, the Middle East, Africa and China. Our approach to working with you is designed with a single purpose in mind. It is to make the experience as streamlined and simple as possible without being simplistic, and to maximize your return on investment. We listen, hear and interpret your needs offering insight without being intrusive. We pride ourselves in being flexible in how we work with you and your team. Flexibility creates space for us to innovate, which in turn gives us time to partner and support you in the critical requirements planning phase and beyond. 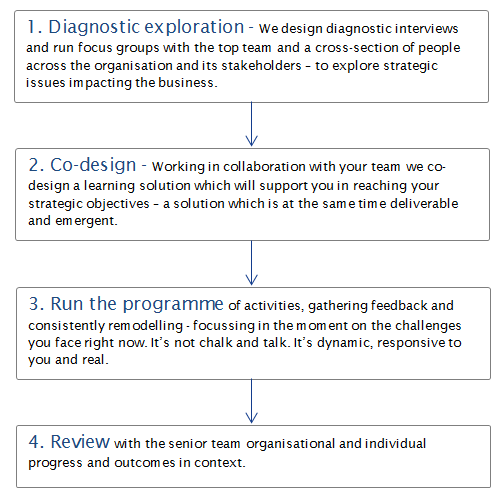 We have a four stage process for designing, developing, delivering and evaluating our partnership approach. By practising this approach, we create the perfect conditions to consistently deliver a client centred experience, with excellence. When you invest in executive education, you want a return. Preferably quickly, immediately. The more we understand about you, your organisation and your challenges, the more focused we can be and the sooner you achieve your outcomes.